Have you seen this book yet? 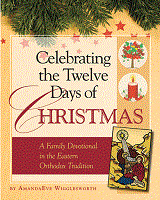 Celebrating the Twelve Days of Christmas by AmandaEve Wigglesworth is a slim volume packed with lovely ideas for celebrating the Nativity of our Lord and the Twelve Days of the Christmas Season. It offers a two page spread on the life of the saint celebrated on each of the twelve days, a small lesson to be learned, and suggestions of simple activities and crafts to complete each day. I am so happy that we added this book to our collection and will be able to use it this year. If you hurry, I think that there is still time to get it for your family to use!